Click on the link, or the picture, to see a 7 min video ‘Ruth Schwartländer: “Why Nano in Technology?”‘ Her talk describes how cells communicate with their environment by introducing forces into the surrounding complex 3D network of fibres. There is a short film in the video showing cells moving and shaping the surrounding matrix, the still above is from the film. I met Ruth at a social evening in Geneva and really enjoyed talking to her about her research. It was inspiring to meet someone so smart and who could explain some tricky concepts to someone not in her field. It is now well established that cells talk to cells using mechanical signals transmitted through the connective tissue matrix. This is fantastic research for body workers (1). By influencing the macro scale of connective tissues we are also influencing the nano scale signalling between cells. The extracellular protein matrix connects into the internal cytoskeleton of the cell. Cells do not only talk to other cells by fluid chemical signals, such as hormones, neurotransmitters and cytokines, they also signal to each other by pulls and twists in the protein matrix. Cells sense properties from the matrix which leads to certain behaviours. 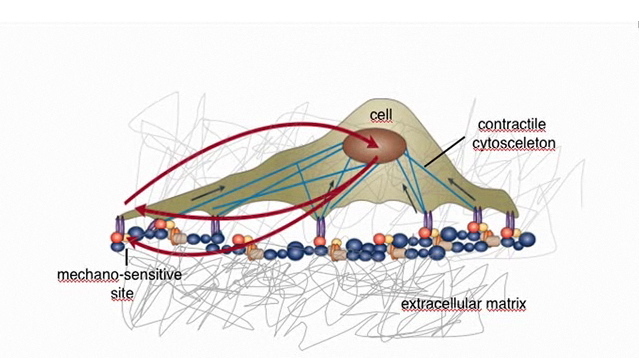 The contractile cytoskeleton connects the extracellular force bearing network to the inside of the cell. The functions of the cell, its use of DNA to produce RNA to produce peptides, is altered by the signals it receives from its environment. Ruth’s research is about understanding and measuring the strain state in individual protein fibres. She explained how pulling on a long, complex protein chain opens up pockets of molecules that are now available to bind to different receptors on cells. One of the surprising things to have emerged from the research is that there are lots of potential binding sites on the proteins used to make the connective tissue matrix (fibronectin is the protein Ruth is researching). Fibronectin is used all over the body. Depending on its strain state the protein can transmit a huge variety of signals, the surprise was that there were not different proteins used in different parts of the body. So the proteins fibres that liver cells use to communicate are the same as the protein fibres in the heart, for example. The heart cells mold and shape the protein fibres differently to liver cells and expose different binding sites on the surrounding scaffold to signal different information. In a culture dish, when new cells are inserted into a matrix created by other cells they actively sculpt the matrix. The cells are not static or passive. They move around the scaffold and apply traction forces to the protein fibres. The protein fibres unravel and unfold to expose single molecules that can act as new binding sites. By understanding more about the interactions of cells and the soft tissue matrix it is hoped to be able to improve transplants and delivery of site specific drugs. (1) This is not a new idea for bodyworkers. We discuss ‘mechanotransduction’ in the book. Our references are Ingber (2008) and Oschman (2000) below. 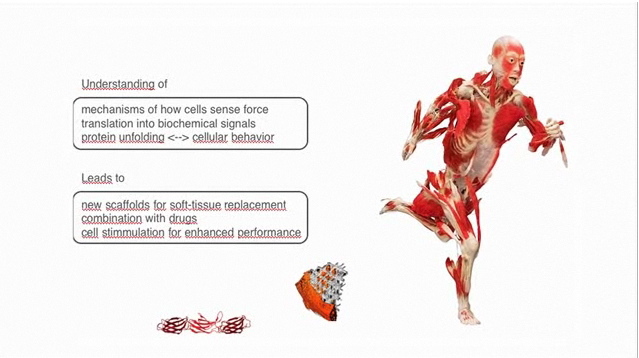 Ruth’s work and video is a new angle on this model and very affirming of the potential of bodywork to influence one of the signalling methods of the body. Ingber, D.E. (2008) ‘Tensegrity and mechanotransduction.’ Journal of Bodywork and Movement Therapies 12, 198–200. Oschman, J. (2000) Energy Medicine: The Scientific Basis. Edinburgh: Churchill Livingstone.